I work in the public sector – a place where “civil servants” are well known for arriving exactly at their start time, taking an immediate coffee break, working their day, and staying not a minute past their eight hours. Though I don’t fit that mold, my job has typically adhered more or less to a forty hour work week. However, I’m heading up a huge project for my university, and with not enough support staff I’m suddenly living the “corporate life” – working 11-14 hour days just to keep things afloat. This clearly leaves little time for the four-legged members of our family. Thankfully, my mother is able to make sure everyone is cared for, now that she’s retired. Still, it leaves a hole in my life … and it seems the same is true for the horses. As I wrote in a recent post, I suspected that some of Noble’s misbehavior this winter had roots in not getting enough attention from me. So, in spite of the crazy hours I’m keeping, I make time every night to go out for chores. It’s always dark by then, and though we have electricity to the barn, we keep it cutoff unless absolutely necessary – a tip my veterinarian offered, her own barn having caught fire from bad wiring. So, chores are done with headlamps alone. It works for us, and the horses certainly don’t mind the dark. 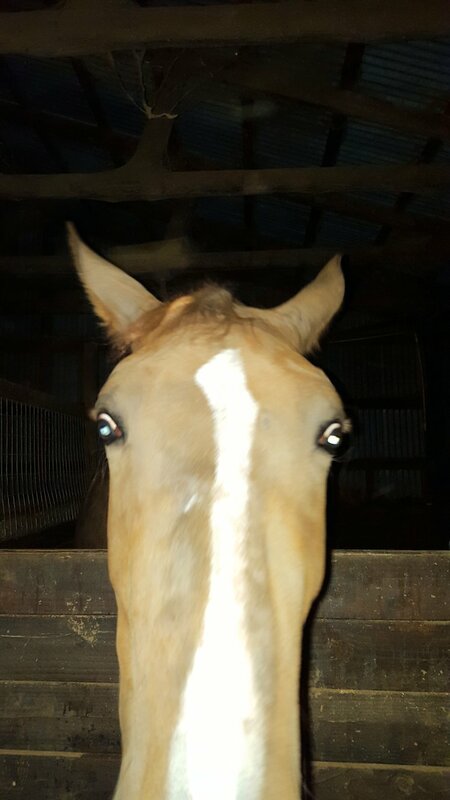 Each night I give out the requisite greetings – giving each long face a rub and offering a carrot piece. Everyone seems happy to see me. To the jaded, that would just mean that they all like carrots – which, of course, they certainly do. But each horse also takes extra time just to stand and “converse”. So I make my rounds, snuffling noses and rubbing foreheads. Once the horses are fed, the two Appys settle down to eat – but Tally and Noble are never satisfied with just their food. The two giants of the barn stretch their heads and necks in my direction, demanding just a little bit more … attention, not carrots. If you’ve been a parent, or a teacher, you’ll know what those moments feel like – each child vying to be the one you pay attention to. There’s a combination of annoyance at the competing demands you cannot satisfy, and endearment for those beings that see you as so important to their lives. “Wait your turn,” I’ll tell one while I gravitate toward the other. Although I don’t have the time to take them out, I offer both something they really enjoy – a good hearty scratch! Both Tally and Noble love the dig-down, “give it all you’ve got”, type of scratches. Tally has her select favorite spots, but with Noble it varies day to day. Although I’m mentally tired on these nights, there is something invigorating about putting muscle into a good scratch. Watching the blissful expressions on their stretched out heads, lips wriggling in rhythm to the scratching, brings a smile to my face every time. Science has shown that these scratches release “happy” hormones for the horse – and on these nights it does the same for me. Standing in the dark barn giving scratches makes the troubles of the day, and the thoughts of the work yet to do that night, melt away. Though it gets me no closer to being in the saddle, it seems to fill a need deep inside of me … and, judging by their behavior, deep inside of the horses. It’s not enough for the long term, but on these dark winter nights, it will do. This is the first morning of the three-day weekend. The weather is supposed to be nice. My most recent crunch for the project is passed. Recruitment for my open positions will get underway soon. Next week will be another very long one – but for now, I look forward to three lovely days spent with the horses. And, in case I was considering spending time away from the barn, Noble has made sure to break a few things. That way, there will be bonus opportunities to ask for scratches. This entry was posted in My Journey and tagged bonding time, Coffee, Nash, Noble, scratches, spending time with horses, Tally, too much work. Bookmark the permalink. I always try to remember that to our horses, our personal agendas matter little! That is so true Christina! Aw, I can see myself doing this. Hoping time will open up for you. Soon!! Sidenote, I knew a stallion who wanted to be scratched by a big O rake! Especially under his belly. He loved it! Some really like that scratching! My first horse loved to lay in a gravely part of his pen, and rub his belly back and forth against the ground … upper lip twitching with delight!